MANET and WSN, both technologies are useful in emergency communication, but nowadays other techniques are also playing efficiently. IoT is one of them that can help in emergencies due to its quick data-transmitting capability, from the sensor to server, or application through the cloud or monitoring station, directly. 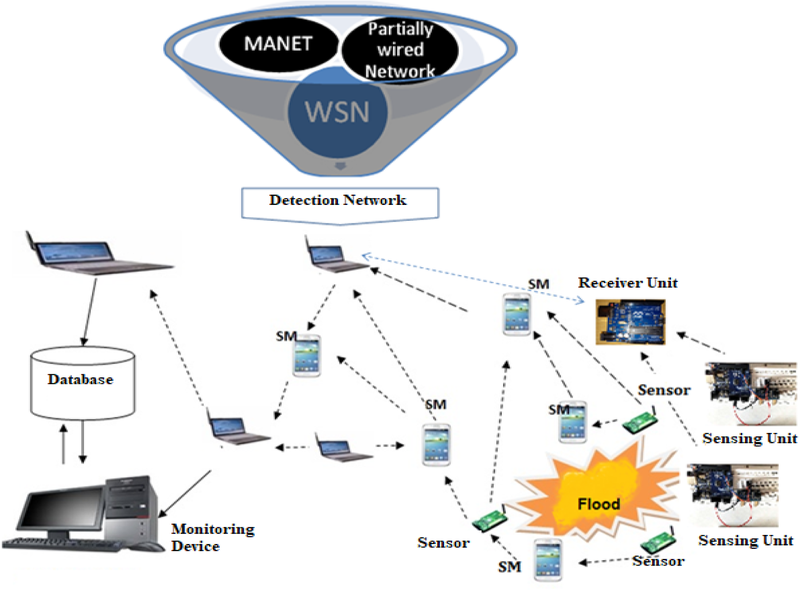 This paper reviewed existing projects of WSN, MANET and IoT involved in sensing and proposed a new device deployment strategy for accurate detection of correct water level in urban flood-like situation. 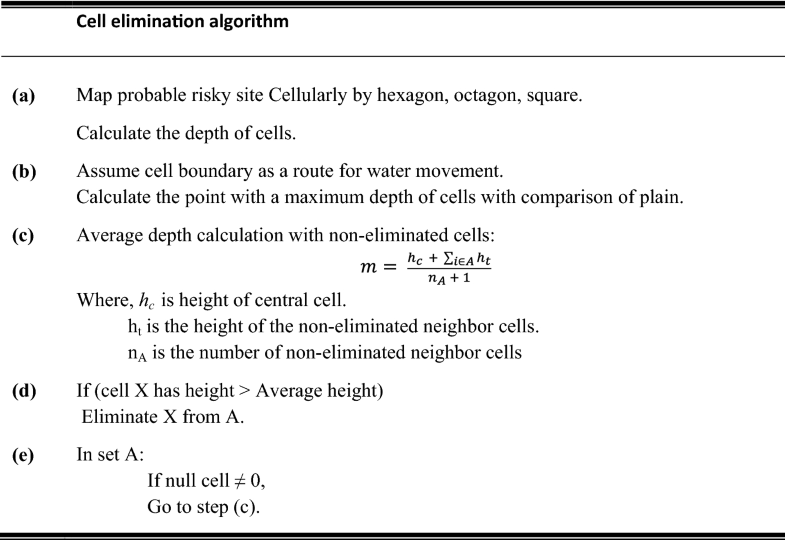 For the device deployment, a cell elimination algorithm has suggested to locate the possible position of the place, where water logging is possible very quickly after a rainfall. 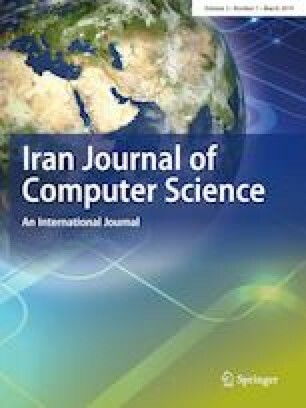 In this paper, the authors discussed the cost estimation for flood detection networks with an example of deploying it in a campus of BBAU, Lucknow, India. In a nutshell, the paper presents a way to detect flood using IoT with cell elimination to find the location to deploy devices. Sensor-based applications are currently increasing in these days in various areas to gather the various kinds of data; out of these, applications in robotics , disaster management  and many others are considerable. Several emergency information systems are using different technologies to solve the problem of single or more phases of disaster management. The topic covered in this paper is useful to perform the preparedness phase of disaster management phase, where detection of the probability of a disaster is having its own importance. In case of flood, accurate and timely flood detection is important; this work is trying to make help to achieve the task of timely, accurate and low-cost detection. An efficient and low-cost flood detection and deployment methodology is suggested in this work. A new way to analyze flood detection is adopted to be used in the mechanism discussed by Kumar et al. who discussed a hybrid architecture with the benefits of Alomari et al.. It involves in the generation of data according to the perception of the sensors; these data were processed by single-board computers or IoT gateways. Ultrasonic sensor is connected to the Arduino through a digital input pin and an output pin. The Arduino converts the pulses given by the sensor trigger into the distance through a mathematical arrangement, which is then sent from serial port to the monitoring station through a gateway and stored in there as a board data acquisition. On the basis of different benefits and drawback of various nodes, author proposed a network architecture to make help in communication with the help of IoT nodes integrated with sensors in Sect. 3. In the second section of paper, an extensive literature review has been presented, in which few applications of these two technologies including mobile ad hoc network (MANET) and wireless sensor network (WSN) have been considered. Second part of this section is having a summary in which current project of various technologies that are designed to perform a specific task is presented. Third part of the same section presents a summary showing difference in the nature of these two technologies involved in sensing and communication with IoT. Section 3 presents network architecture suggested, approach for flood detection and strategy for deployment. Network architecture presented in the third section that is followed by an approach for flood detection and a cell elimination algorithm to suggest positions for node deployment. Analysis of the result, a fourth section in this paper, presents a simulation of the cell elimination algorithm and flood level detection; while the third part in the same section presents a cost estimation of the detection network to be deployed using an experimental setup assumed for the Babasaheb Bhimrao Ambedkar University Campus, Lucknow, India. This cost estimation presents a cost per set deployed for 1–30 sets that is the number of nodes required from minimum to maximum for the project according to our deployment methodology after choosing the location to be deployed. After Sect. 4, a conclusion has drawn in Sect. 5 indicating pros and cons of the scheme. Section 5 indicates how the new deployment scheme is better and able to provide deepest places in a certain path where an amount of water will go first. This section also provides direction of future work with the limitations of the work. Mainly, two kinds of approaches to detect the disaster event were found in literature consisting MANET-based approach and WSN-based approaches; we have considered applications of them for various disasters. MANET is considered as a highly dynamic topology by many researchers, including Nayyar et al. , but focusing on problem in data access in their work , these researchers has suggested many tools to simulate the MANET scenarios . Several projects are going on to help in disaster management through MANET; few of them has been included in this section in different categories. GIS modeling-based tools: MacEachren et al. has described a client–server-based tool developed by Geodan that offers real-time analysis components to help in disaster management at control centers. This tool was helpful to analyze the operation by top officials at the control center; so it is helpful to manage the operation. This tool cannot be modified and operated by the mobile device, that is why, it is not operable in a harsh environment through the wireless medium which is more valuable and important as per victim’s point of view. ESRI developed client–server-based tool ArcPAD  for mobile devices to provide an ability to capture, analyze and display geographic information. It is a tool for disasters where infrastructure is in working condition that is generally not possible in natural calamities. It has a drawback that it was not able to be used in ad hoc environments. Capata et al. presented a Geo-based application  to support in outdoor environments for rescuers, within MANET-collaborated devices. This application was designed to address the need of the rescue team for geographic information based on maps to provide geo-information with GIS functionalities and not helpful to victims. It works smoothly when infrastructure facilities are available, but in its absence, it is using P2PMANET in the front end to make coordination between the rescuers; so it is only applicable to group members within a certain range and not to the victims. SAHANA FOSS was designed to use in the relief phase to solve the problems generated by disasters, which was used in the Philippines during Southern Leyte Mudslide of 2006 . With the inspiration of SAHANA FOSS, Fajardo et al. designed an application known as MyDisasterDroid, in which they find the geographic location via SMS or app installation, while they calculate the distance through TSP in the app. Fajardo et al. applied the genetic algorithm to find out an optimal solution through the calculation of distance with the decision of fitness of the possible routes, in which they have assumed less distance route as the fittest solution. In this App, they have used TSP as a route finder algorithm for rescuers and uses GA to find an optimum solution from those paths; however, we know that traveling salesman problem is an NP-complete problem that might fail in the rapid increase on possible routes with the addition of new cities within in networks. HAZUS  is a modeling tool to estimate loss due to natural disasters through GIS-based modeling; it estimates social, physical, and economic impacts with visual representations using maps. Areal Location of Hazardous Atmospheres (ALOHA)  is an effect estimation tool for different gasses through pressure, storage temperature and wind speed. Standard Unified Modeling, Mapping and Integration Toolkit (SUMMIT)  is a tool that enables analysts, emergency planners, responders, and decision-makers in planning, workout, or operational response. Cloud system: Al-Akkad et al. have proposed the idea of information sharing within the just created MANETs. They have created MANET between devices on the move within the range of each other. Data sharing between the devices within the MANET continues till the possibility of its sharing with the outside world. Lastly, if one client device manages to connect to a network providing Internet access, it can relay all collected data to the online world. This has the only drawback that its working depends on the Wi-Fi interface. The WSN-based projects were popular, and with the help of these, researchers found good results in their applications. 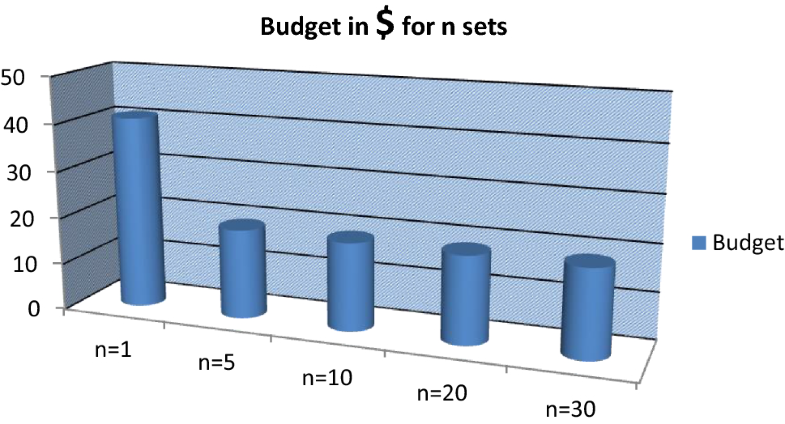 In this series, Nayyar and Singh  have suggested different simulation tools to check the performance of this network, but very few work was found to sense the real-life use of WSN in projects. Few WSN projects are considered here due to their specific application and characteristics. Baez et al. proposed a system consisting of WSN and a Server, in which WSN is used to constantly monitor the flood levels in the area, while the server stores and analyzes the data with the comparison of a threshold value. WSN has two kinds of node as a sensor and sink. In this mechanism, sensor ishoused within a pipe, made by PVC with the 10-W Polycrystalline solar panel with a 1200-mAh rechargeable battery pack. MAX  was a WSN designed for low energy and less delay querying with an aim to provide location information through identifiable landmarks, not by coordinates. This network was designed with Crossbow Mote. Second tool was CenWits  that is a WSN designed for search-and-rescue, in which information are collected by sensors, GPS receivers, and location points, to provide location information. They use the sensor Mica designed by Berkeley. Volcanic monitoring project , in which sensor nodes were deployed, was a WSN of 14 sensor nodes equipped with GS-11 geophone with the corner frequency of 4.5 Hz, while the other two sensor nodes carried seismometers with corner frequencies of 1 Hz. The hardware interface board was designed with four AD7710 ADCs to integrate with the T-mote sky devices. Motes of this network store sensed data in its flash memory and route message to the base station. This network utilizes T-mote sky and seismometer as a node. In Brazil, flood monitoring  project was started with the help of WSN that was deployed with the Xbee nodes. Loosely coupled Component Infrastructure is presented by Ueyama et al. at different conferences to monitor the flood in a river using the motes with the help of various APIs applied. Another flood monitoring and warning system was discussed by Sunkpho and Ootamakorn  to be applied over southern parts of Thailand with the objective of better collaboration between authorities and experts of flood watching the situation every time and involved in flood monitoring with the help of deployment of Starflow sensor and precipitation sensor. In this row, another work is performed by Khedo  to monitor flood in river basin using the MicaZ and SunSPOT with the help of the JDK. Tables 1, 2 and 3 present a summary of running projects for helping during disasters using WSN, MANET, and IoT. For better collaboration between authorities and experts of flood monitoring as well as to provide a web-based information source for the public to find information related to flood. On the other hand, not more projects of flood monitoring using IoT were found initially, but few good works developed to help in flood management were considered here. Problem: All the existing approaches are not providing accurate and timely information, while WSN uses dense and random deployment policy that makes cost high, MANET depends on the GIS system and does not provide real-time data instantly; thus, there is a need to develop a better mechanism in terms of timeliness and accuracy on low cost. Table 4 compares WSN and MANET nodes with IoT-based detection systems. This table is answering the third question of problem statement through the comparison of characteristics of systems as: Yes = + , No = −, Approximate/eventually = ± , No meaning = 0. All the systems have some drawbacks due to its design for the specific application; these systems are assumed as well for the particular application but not for all. So, there is a need of a model to implement to help in maximum disaster management with very few changes. This system should not be prone to a lifetime on battery power because its dependency on battery power makes it useless in a typical real-time situation if battery compromises due to any reason. After seeing the problems of the various networks, it is important to use another kind of technology that will be better in all aspects. This section suggests an alert mechanism that is depicted in Fig. 2, assumed with the water level detection devices to compute probability of flood. This kind of device may become a node in the MANET, WSN or alone. Connection of water level detection device with a Wi-Fi-enabled device that may be connected with the internet or may not, is shown in Fig. 1, and a deployment strategy to deploy this kind of device has been suggested in this section. IoT devices can be used in the pre-disaster scene to detect and process the data to gateway where it can be analyzed or propagated to the connected cloud. Sensor node Different kinds of sensors can be used for emergency detection and processing in the development of IoT-enabled alert network. Figure 1 assumes network, including sensor node, smartphone devices as SM, laptops, desktop computers as a monitoring device and ultrasonic sensor (USS). This network includes microcontroller-based single-board computer as shown in figure, but it may be Arduino board or Raspberry pi board. This has the capability to interact with other networks in a wired or wireless environment. We are trying to detect the flood so we have assumed ultrasonic sensor to measure a water level. IoT-based flood detection device works with the help of ultrasonic sensors, Arduino UNO board and Arduino software. Ultrasonic sensor An ultrasonic sensor generates a high-frequency sound waves as an echo that come back in reception by chirp. Ultrasonic sensor works with the help of transmission and reception of sound waves. Sound waves emitted by transmitter are reflected by water and received back in the transducer. In transmitting and receiving a signal, ultrasonic sensor just takes time proportional to its distance. Arduino UNO board It is a microcontroller-based single-board computer, used to design a digital device and useful just like other boards as discussed . These systems provide sets of digital and analog I/O to connect it to the circuit. On this board, a program can be loaded from a computer that can work on sensor attached to the circuit. 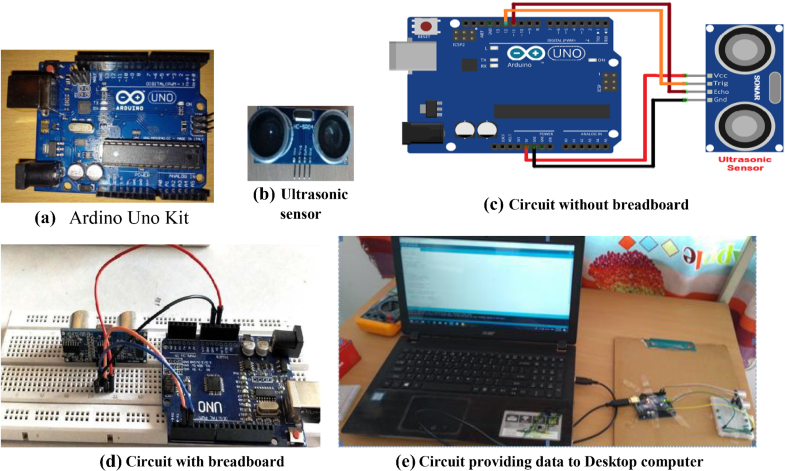 Arduino UNO provides data collected by ultrasonic sensor to the computer. 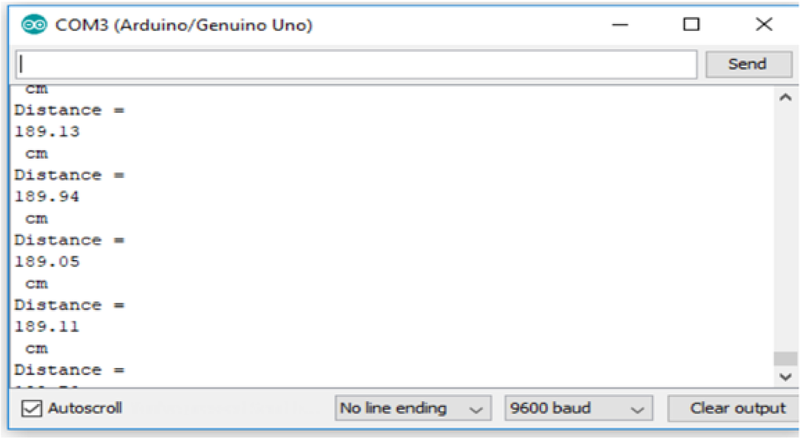 Software: Arduino software IDE is a cross-platform application written in the programming language Java to help the newcomer programmers in development especially useful for Arduino boards . A program written on IDE is known as “sketch”, that can be written in C and C++ with special rules. The device indicated in Fig. 1 is able to transfer sensed data to a machine having Arduino UNO. From this machine people can transfer data in the entire network and can utilize as per need. The architecture of the above-discussed network is assumed as per Fig. 2. Our approach to detect a flood or water logging in any area or region is very simple, in which after the detection of deepest place of the region using any technique, i.e., authors presented cell elimination algorithm, detection device must be deployed. Proposed devices have an ultrasonic sensor to sense the distance from water level and run a procedure in the microcontroller that is shown in Fig. 3a, to transmit data to the monitoring station connected to it. Here, a flow chart shown in Fig. 3b is a scheme to find out the decision whether flood is possible or not after analyzing the data. This is a flowchart to be performed in future and discussed here just only to clear the picture about the method of flood detection. According to this flowchart, data of different n devices deployed at the same sea level should be collected and analyzed. On the basis of the analysed data, decision of possibility of event will be taken. To detect a flood disaster, the idea is to deploy ultrasonic sensor device on the path of water flow with the Arduino device. Ultrasonic device will provide the information about water level to monitoring device using Arduino UNO board. But, ultrasonic sensor can provide timely information only after its deployment on exact location. 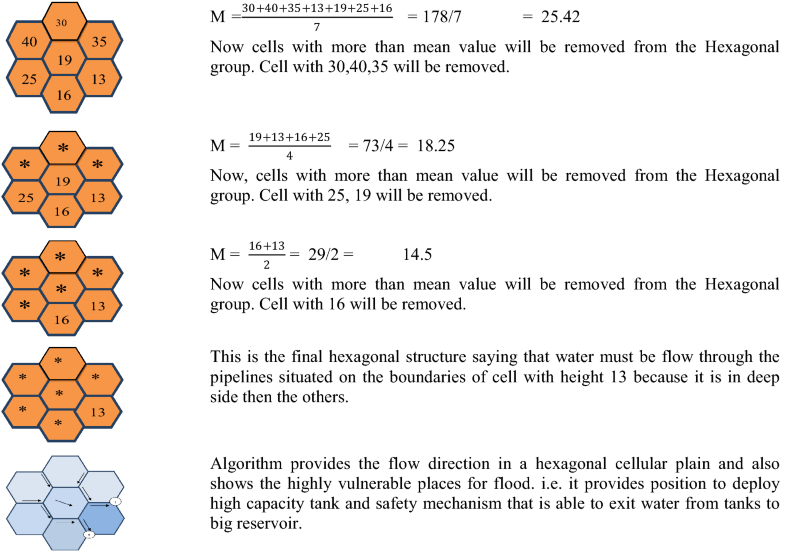 Simulation of cell elimination algorithm and working of flood detection setup are mainly considered in this section. 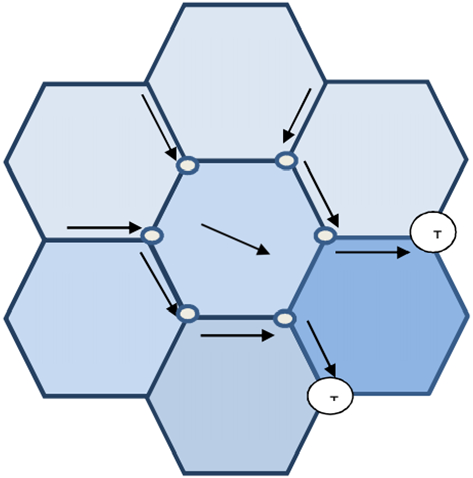 To simulate the algorithm, authors applied its steps for a imaginary area, and found out the path of flow in that case. While errors of detection device are counted by different distances between water and setup, cost of deployment of these devices for a campus is also considered with real-time prices that shows the exact budget of deployment at present. An ultrasonic sensor measures distance to an object by sending and receiving sound waves at roughly 40 kHz. The accuracy of ultrasonic sensor can be affected by the temperature and humidity of the air it is being used in. According to the presented formulae, time taken in measurement is negligible. Now, the delay only depends on the standard used because the ultrasonic sensor is just arranged with a transmitter, a single-board computer and a Wi-Fi or any other transmitter while other end is arranged with its respective receiver. Just like a screenshot of data retrieved in Fig. 4, we have taken multiple samples from various distances under the range of ultrasonic sensor and found few wrong values in this range, the signal percentage of which is just considered as an error per sample and we have used it to find out the performance of sensor or link from sensor to output device. Number of irrelevant readings per 100 reading has been assumed as a corrupted value and ratio of that values counted for various distances. For various distances, errors per sample are shown in Fig. 5 that is derived on the basis of Table 5; however, it also may be sometimes due to other factors including manual errors because of readings taken over a pool of open environment. A map of BBAU is shown in Fig. 6 having red colored dots assumed as the poles to deploy detection devices. So, the number of red dots provides number of devices to be deployed. No of poles decided is 30 but the cost is varying by the purchase of components through groups. When all the components of device purchased from amazon.com, minimum cost to be to deploy the network with the minimum component of networks for a developed area of a city as per links [24, 25, 26, 27, 28, 29, 30, 31, 32, 33], considered to purchase ultrasonic sensor, Arduino board, connecting wire, and LCD. In the work discussed, the cost is calculated for deployment of devices only for a university campus, while maintenance cost and other miscellaneous cost are not considered. The graph in Fig. 5 simply concludes the accuracy of the device to detect the water level that is helpful to decide a threshold to check the level of danger, while the graph of Figs. 7, 8 and 9 shows that the cost of deployment in bulk is not a much more to deploy; and any institute can deploy network at low cost. Here, graph in Fig. 9 presents total cost of the device to be deployed. 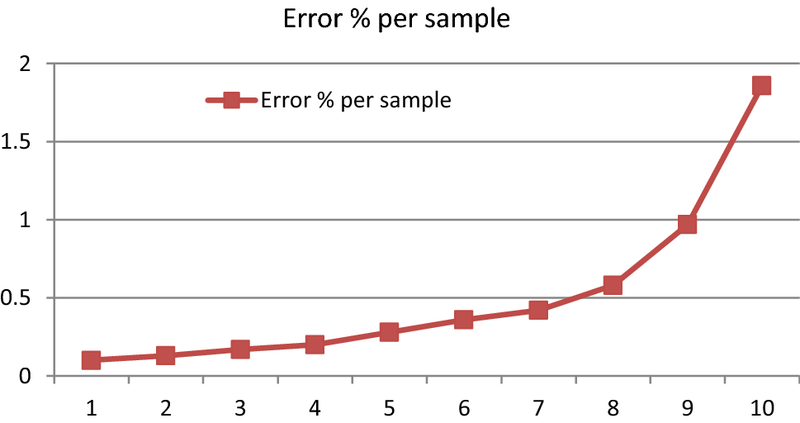 The performance of IoT-enabled device has been considered in terms of accuracy in reading. Apart from this, the cost of IoT-enabled flood detection network deployed with the IoT-enabled devices has been assumed on the basis of real prices of devices in the market. Here, the cost of various parts of the devices is considered on the basis of RAL data. In the data acquired, we have found that the IoT-dependent setup provides more accurate data than the traditional manual measurement as per Fig. 6. All the improvement in sensing devices and algorithm will improve the network, so the performance of this network will depend on device and algorithm used; it means this will provide the scalability to the architecture. Sensor networks hold a lot of promise in applications where information gathering about remote locations is required, but in case of urban flooding, when system can be deployed with the computer or LCD, it has privileges of wired communication over the wireless. So, it should be deployed where accuracy matters and people wish to find log record. Sensing device’s cost is estimated using the current price of its components, and the estimated price is found to be very low when developed in bulk. Graphs present a scene in which cost has reached a constant level for a bulk deployment. 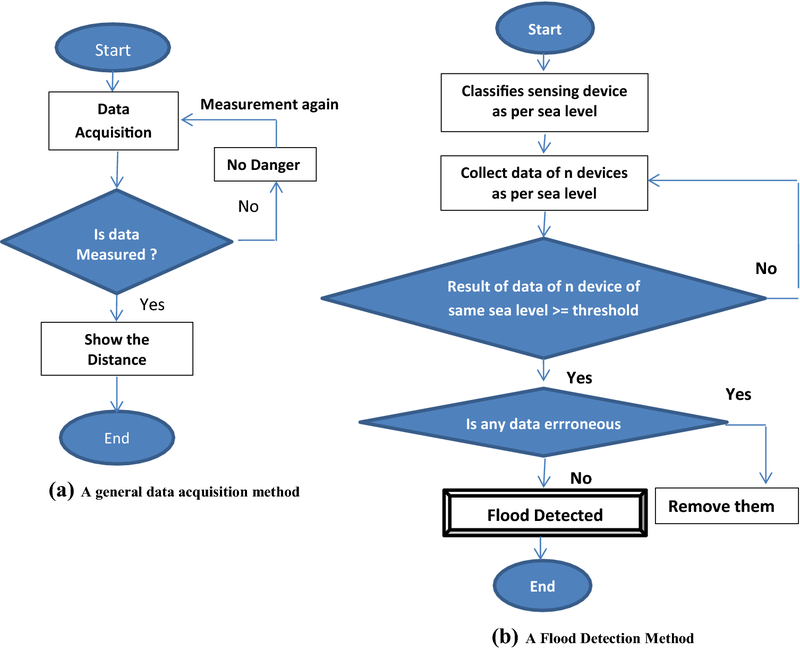 Future work: the researchers deployed the device to acquire real-time data from the setup discussed by other researchers and found out the accuracy in different scenarios on different distances but was unable to get data from many devices deployed at same sea level as per the flowchart discussed in Fig. 3b. So, the data acquisition to decide the flood, from various devices deployed at same sea level and different sea level at a server, will be the next work to perform and it will be the future work.